Enlarged to show detail. Shown with optional chain. Brilliant and sparkling, this solid 14k gold tiny bow pendant has 20 dazzling pavé-set Diamonlux™ cubic zirconias. Sold as an individual pendant, this bow works well with most chain styles. Or, upgrade to Tiny Blessings exclusive Italian-made chain, featuring diamond cut luster and adjustable sizes to accommodate your fast-growing girl. 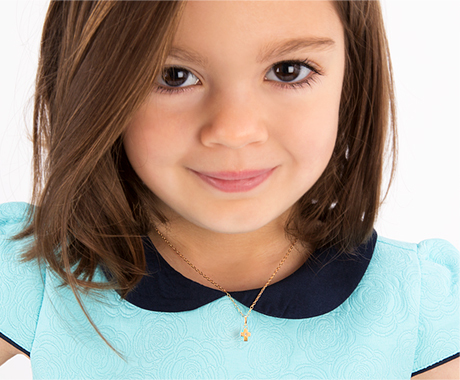 Made with all high-end materials, this pendant is hypoallergenic and designed specifically for children. All V.I.P. Sale items are final sale. Due to the deeply discounted prices, all VIP Sale products are sold as is and do not qualify for returns, exchanges, or refunds.